I am 36 years old, went to UF and have lived in Gainesville for 18 years – go Gators! I have always worked out – I like strength training and running, have done boot camps and played multiple different sports. I started working out at Axis when I found out I was pregnant because I wanted to make sure I stayed as healthy and fit as possible – for myself and for my baby. I had a great pregnancy – I felt great, felt strong and had energy. And, I was really, really fortunate and had an easy labor. Elliot was born in October 2012, 7 lbs 11 oz, a healthy baby boy! The nurses at the hospital were really impressed by how strong I was. I definitely owe that to Axis! There is no way I would have stayed so fit if I had been working out on my own. I am back at Axis now for what Jake calls my “body back” program. I would definitely recommend Axis for anyone looking to get fit or stay fit. Everyone at Axis is positive, knowledgeable and helpful. And, whether it is private training or small group training, the workouts never get boring because there is always something new to do. I have always enjoyed working out and did it regularly. The one thing that I felt was missing was a continuous level of positive energy from most places I worked out at, or with my past trainers. When that happens, it's very hard to keep up your motivation. Since joining Axis, the energy level has never dropped. Everyone that works here or even works out here, always brings a positive attitude to the table. 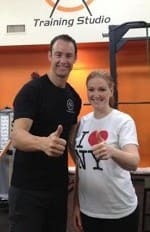 My actual trainer has been amazing and always keeps my workouts new and entertaining. Dan, has not only pushed me to do my best but he continually challenges me to keep up my end of the bargain. In 4 weeks, I lost 7.7lbs of fat and gained 4lbs of muscles. LOVE IT!! Would I recommend AXIS? Heck yes, I would recommend Axis! Not only will you love working out with the trainers here, you will learn that working out is just a part of what Axis has to offer. It also offers continuous education on wellness and fitness. Oh and one more thing, Axis will also keep you smiling! After almost 2 years with AXIS, I went from a size 10 (sometimes 12) to a size 4. My weight dropped from a high of 176 lbs to an average of 145 lbs. I have also changed my diet COMPLETELY...I am gluten free and have cut out processed and enriched foods from my life. I would, and do, recommend AXIS without hesitation. The team at AXIS understands the capacity for the human body to improve and reshape itself...inside out. They believed in my success way before I believed it myself...and my life and health have never been better. With the 2012 Olympics Trials approaching, 24 years after I qualified for the 1988 Track & Field Trials, and 20 years after coaching Women's Track & Field at UF, and after 3 knee surgeries, I wanted my body back! I remember writing that my first day of Boot camp and that I needed a healthy nutrition guide too. 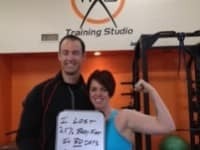 My 1st week, Jake sent me a nutrition plan and my Boot camp journey began. After 3 weeks of 3 nights a week of boot camp, eating 5 small meals or snacks a day and keeping a food log, I lost 8 pounds! The AXIS staff modified my boot camp circuits (due to knee limitations), and supported and encouraged me to finish every night. My life change of exercise and nutrition has gotten this 45 year old, beat up former athlete back on Track (get it, Track & Field....). With 3 weeks remaining of Boot camp, I am motivated and excited to finish strong; My 40's are now my new 40's! Before working out at AXIS, I went to the gym and basically did the same thing, intense cardio and then the weight line. Consequently, I naturally hit a plateau. My ongoing back pain also limited what I could do. I was beyond frustrated because I was doing everything I thought I should be doing. However, in the last 6 months with Jonathan, I’m excited to say that isn’t the case any longer. Having Jonathan and Rose both on my team has made a huge difference in my progress. My body composition has changed immensely losing a total of 37 pounds and 8.9% body fat. I am in the best shape of my life and couldn’t feel better thanks to my team! AXIS is the best! The services provided are personal and unique to each client. My workouts are constantly changing which challenges me to continually get better and not get bored. The focus isn’t only on fitness but also on nutrition. Jonathan has an insane amount of knowledge that he pours into his clients to help them help themselves. My workouts at the studio are honestly the best part of my day. Although I haven’t reached my final goal, I have complete confidence that I’ll get there. I would recommend AXIS! The main reason is the PEOPLE. The people who work there are incredible. They are motivated to see that you reach your goals. They hold you accountable. They want you to succeed! It is nice to know that if I don’t show up at small group training, someone is going to notice and ask me why I wasn’t there. You don’t get that at a big gym or group fitness classes. And the people who go there are awesome too. I was only there for a few months, but I felt like everyone was so welcoming and it made it FUN to work out! I would definitely recommend AXIS to anyone looking for a personal touch and the perfect motivation necessary to achieve your weight loss and healthy lifestyle goals. My life before AXIS was work and school only. Other than that, I was not active. With our first child coming, I wanted to have a healthier lifestyle and have more energy. After starting training at AXIS, my clothing is fitting better. I have more energy now than I thought capable. Work and school have also improved dramatically as far as those activities not exhausting me. I would recommend AXIS because I find the motivation and support that I need when I am feeling tired or a lack of motivation. AXIS supports me not only in working out but in making a total, healthier lifestyle change. Before AXIS, I was in constant pain in all my joints. There would be days I would wake up and it would be hard to keep doing all the activities that needed to be done. Before going to bed each night, I would need a heating pad to relax my muscles enough to go to sleep. Since training here at AXIS, I'm starting to have a great feeling that I will get my flat tummy again as my pouch is disappearing. The best part is that I don't hurt anymore! I would recommend AXIS. It is the ultimate in personal training. They encourage you to keep going and try different things. The best part is you will get results. I have always been interested and inclined to sports but residency and work created havoc with my routines and unfortunately exercising and eating right were not on my priority list and I hate to admit it, not even on my to do list. The consequences were easily seen, especially in my waistline. I tried different programs that worked but in reality I did not have a clear set of goals. I also tried several (I'm not naming any names) of those TV programs that offer after X amount of time, you will have a six pack and look like a body builder while you continue to eat everything in front of you. Gradually, I started gaining weight until one day I went to use a pair of pants from my closet and I could no longer convince myself of the excuse that they had shrunk. I had to do something but I was always making excuses for not working out. I knew I needed help. I heard about AXIS and I made a commitment. Here I am 5 months later. I still remember the first workout; I almost passed out after the first two exercises! I did not think Jake would take me as a client. I was in bad shape. One thing about AXIS and its staff is that they set personalized goals and are sincere about what to expect. I am not there yet; in fact I am halfway in terms of weight loss and fat percentage and I thank them for providing me with a clear plan and realistic goals. I have been very motivated to continue and I enjoy the workouts and the feeling I get afterwards. By the way, the pants I was talking about, I am wearing them again! I would recommend AXIS without any hesitation. Anyone who is ready to take control of their life and body, wishes to get rid of layers of fat, recover from injury or even if they are an elite athlete, everyone should give AXIS a try. AXIS provides a program tailored to your strengths and weaknesses and more importantly, to your vulnerabilities. They also keep track of your eating habits and provide you with the necessary skills and plans to improve your diet. AXIS motivates you, keeps you entertained, and makes exercising fun! Before small group training at AXIS, my weight had skyrocketed. I was not exercising, even though I had a long time gym membership. On top of it, I was snacking a lot, especially late in the evening. Since working out at AXIS, the weight is coming off and I feel healthier. The workouts and trainers are great, but the greatest benefit is the motivation. I am setting health goals and establishing a workout routine... not something anyone would have expected me to do. I would give a heartfelt endorsement of AXIS because it works! I have received numerous compliments on the healthier me! Prior to joining Axis, I was fairly out of shape. I smoked about a pack a day and never exercised. Working long hours in a high stress environment provided me little outlet for stress relief and when I would make an attempt at exercising, I would become winded just jogging down the street. My body had been subjected to a variety of injuries due to motocross racing over the years and felt pretty beat up. Needless to say I was not the poster child to a healthy 31 year old. Since joining Axis, I have never felt more energized. In a few weeks I will turn 32 and I feel more energetic than I did at 26. I am no longer winded walking down the street. Much of my pain from accidents is gone, I have found that I sleep better, have a better appetite and best of all have been able to quit smoking! I would recommend Axis to anyone looking to change their life. I know myself well enough to know that unless I have an appointment with someone to train me at a specific time I will never workout on my own. Jonathan and Axis were able to cure this procrastination and make sure I am there every time. If you suffer from any injuries, Axis focuses on correcting them before just throwing weights on you. I would have to say Axis has helped me get a new lease on life! I was tired, unhappy, stiff, constantly hurting and beginning to become a hermit because of all the extra weight. I was in my chiropractors office 2 or 3 days a week every week just to keep moving. I was walking in the mall at a leisurely pace earlier this year and I could not keep up with a basic conversation while walking and decided ok that's it...I had enough and I was finally sick and tired of being sick and tired. I had a not so great experience at a different fitness facility in town so I really did a lot of digging into fitness professionals in the area and eventually came across Axis. I started to workout with Jonathan and each time I go I still can't believe how far I've come. I no longer dread stairs, I can walk and talk without gasping for air, I stand up straight, my legs have shape again, my pains are pretty much gone and at 45 I can do squats on an upside down bosu ball. Mmm hmmm, yes I can. Jonathan had me write all my food down so my diet has been cleaned up significantly and he is always evaluating what I eat and giving lots of good feedback. Water is now the #1 beverage of life. Because of this in 3 months I had lost 20 inches, my face no longer blows up like beet when I tie my shoes and my chiropractor is probably wondering if I moved away because I went from being his best customer to a distant memory in a few months time. Awesome doesn't even cover it. If you think you can't, these guys will show you in most cases you definitely can. I cannot tell you how thankful I am that Axis made its way into my life. It really has made its way into my life because it's so much more than 60 minutes 3 times a week. I wouldn't hesitate for a minute to recommend this facility to anyone. In fact, I sent my boss over to them. This is the only place who listened to my concerns, figured out what my needs were and have done nothing but told me "Yes you can, Shari" even when I wasn't so sure I could. There is no one size fits all mentality here. My only regret is that I didn't find Axis sooner. Before AXIS I worked out regularly and even hired 2 separate personal trainers. It wasn't until I joined AXIS that I realized what those other trainers were missing: ENERGY, MOTIVATION, CONSISTENCY, and ACCOUNTABILITY. The other trainers had knowledge and skills but personal training is much more than designing work outs and counting reps for someone. It is about the full package. AXIS is the full package. Not only is my trainer Dan amazing and motivating but he clearly designs workouts that are meant to attain the goals that I want to achieve. The small group training classes are so motivating and fun and it is refreshing that every time you attend everyone knows who you are and asks how you are doing. The environment at AXIS is a huge piece of why I go there. There is always music playing, other trainers and clients cheer you on during your workouts, and there is a plethora of resources and knowledge so you can ask any question and get a solid answer. At AXIS it is not just about counting reps and generic workouts. It is all about YOU when you walk through that door and it feels like a family. So far I have lost almost 8 pounds of fat and gained 3.5 pounds of muscle in 8 weeks. I have re-learned how to eat correctly and am now back to my flat tummy that I have been wanting since I got pregnant with my 2nd child. I have tons of confidence again and feel very strong. For the first time my arms are defined and I feel very confident that my trainer Dan will get me to my goals In fact, I am not sure what to do when I reach my goals because I don't want to leave! Meet Brad: A man with a mission and a purpose. Brad has tried to race dirt bikes competitively in the past, but two things have prevented him from ever doing well enough to win a championship. Brad had a string of injuries that have sidelined him over the years and his fitness was never good enough to win races. (Motocross is an extremely physically demanding sport.) Brad emphasized that "If you don’t win races, you don’t win championships. To win you have to be in peak physical shape." 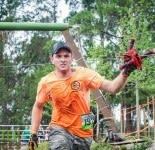 Approximately two years ago, Brad planned on competing in the Florida Trail Riders Hare Scrambles and Enduro series in 2011-2012. Brad would be 50, which would put him in a new race classification, so he felt this could be his year if he prepared properly. 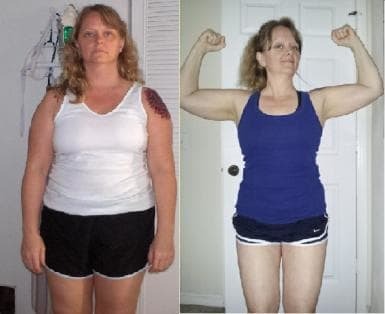 To get in shape, he knew he could not do it on his own and he needed to find a fitness program where he would have structure and accountability. "Some of my co-workers were already attending SGT so I joined and it has transformed my life! 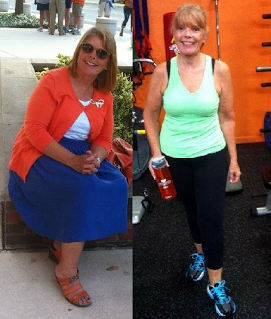 I have lost almost 60 lbs and every facet of my fitness has been revolutionized by the program." Brad admits it is hard work and requires a solid commitment, but he claims the results are outstanding. 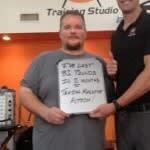 Brad trained four times a week at 6 AM and seldom missed a workout. According to Brad, "The great thing about FBBC is the training staff. They help you achieve your individual fitness goals and keep encouraging you to be your very best. The accountability part not only comes from the trainers but your fellow classmates training alongside of you. You see their results too and it is infectious! We have a lot of fun and that makes it all worth it." 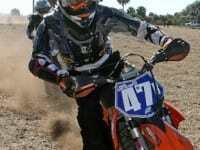 Congratulations Brad on becoming the 2011-12 Florida Trail Riders Master Enduro Class Champion!